Most services do way more than just CRUD. That is: Creating, Reading, Updating, and Deleting, objects in a database. Services often keep data about events that clients want to know about. In the past, API services have provided access to these events via a “polling” API - the client makes calls every few seconds asking for the status, and acts depending on the response. This is generally a wasteful and messy way of sharing that information. Some events may only happen once in a blue moon, so you have to figure out how often to make the polling calls, and you might miss it. The design of an API is as important to a developer as a webpage is to a user. An alternative way of sharing the data about the events if for the service to call the client when an event happens. The client only has to wait and act when it hears something. This method is referred to as a Webhook or Callback service. There are many examples of this already - Stripe processes payments, Mondo can inform you of transactions you make with your credit card, and Twilio can ask you how to handle phone calls. So How Do I Design A Webhook For My Service? The aspect of HTTP APIs I am most passionate about is their design - how the API works from the point of view of the client. It’s as important as the design of a webpage to a user. An API service is a product, and the interface should be treated like any other - it should make sense, it should be easy to use, and it should be well documented. 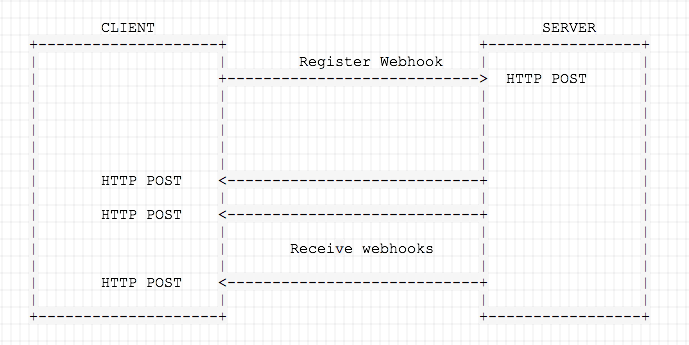 How does a well designed webhook interface work? Letting clients create new webhooks subscriptions. Letting clients manage their webhooks. Sending webhook payloads to clients. For creating new webhooks subscriptions, treat the subscription like any other resource in an HTTP API. Mailgun and Mondo provide this type of interface for their APIs. If your API service wants to provide webhooks for distinctly different things, then separating them into different endpoints is good practice. This allows the client to subscribe describe endpoints in their application to different web hooks, instead of having to process all types of webhooks at one endpoint. What Information Should The Client Send? At the very least, your webhook endpoint should require a callback_url parameter. This should be an absolute URL in the client application. Some services suggest sending an id or webhook_id which can be used by the client if they receive multiple webhooks. You might also want to send an account_id or some way of identifying the user who is creating this webhook. However, that can be inferred from the authentication token. How Should Clients Manage Their Webhook Subscriptions? What Should I Send In Webhook Payloads? This section is where things get interesting. A good webhook service should provide as much information as possible about the event that is being shared, as well as additional information for the client to act upon that event. Payloads should include a timestamp and webhook_id if one was given by the client when creating it. 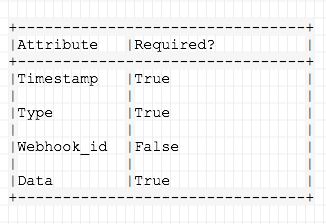 A type attribute should be included if you’re providing different types of webhooks to a single endpoint. 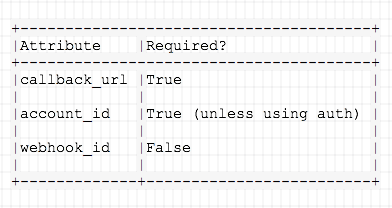 Stripe’s event types are a good example of this done well. The best way to provide the data that is specific to the context of your application, is by wrapping it in a data attribute. Don’t have this at the top level of the response. Wrapping it up separates it from the application-specific content and the content that is informational for the API client. The client should respond with a 200 HTTP status code to confirm it has received the payload. A good webhook service will assume any other response a failed delivery and will queue the request to be sent again at a later date. If the client continues to not reply with a 200 OK response, the Webhook service should wait exponentially longer. After the fourth or fifth request the client is probably not working and the Webhook services should stop trying to talk to it. Documentation - dangerously important and something you’ll always want to provide. Why not write some now? Your designs could just be your docs! Security - not just for talking to your API, but so your service can prove to the client they’re the real deal. Look at Amazon’s guide to verifying signatures or Mandrill’s documentation on authenticating webhook requests. Programming - despite the lack of good tutorial content on webhooks, there are quite a few third party libraries for popular frameworks. Get on GitHub and see what’s available for your favourite language.